Pause Breathe Smile: Awakening Mindfulness When Meditation is Not Enough. Hosted by Kris Welch. Pause…breathe… smile Three small words each containing a universe of wisdom. With these words we are invited to bring the practice of mindfulness into every moment of our lives. This handbook supports the cultivation of awareness, compassion and joy. 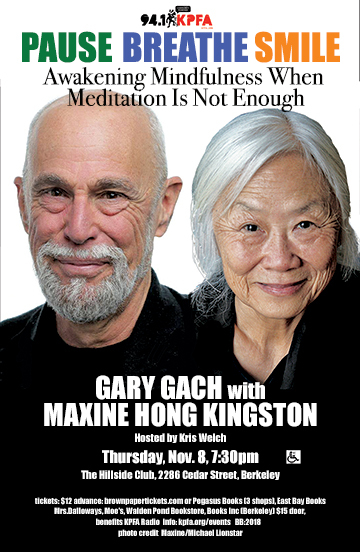 GARY GACH is a writer, mystic, and lifelong meditator who has engaged in many roles: actor, bookstore clerk, dishwasher, hospital administrator, office temp, stevedore, teacher and trypographer. Lay-ordained by Thich Nhat Hanh in 2008, he has authored eight previous books, including The Complete Idiot’s Guide to Buddhism. Maxine Hong Kingston, daughter of Chinese immigrants, is a poet, memoirist, and fiction writer who was born in Stockton, California, and educated at the University of California–Berkeley. She is the author of the book-length poem I Love a Broad Margin to My Life (2011). Kingston’s numerous nonfiction books include The Fifth Book of Peace (2003), To Be the Poet (2002), National Book Award–winner China Men (1980), and National Book Critics Circle Award–winner The Woman Warrior: Memoirs of a Girlhood Among Ghosts (1976). She is also the author of the novel Tripmaster Monkey: His Fake Book (1989). She edited the anthology Veterans of War, Veterans of Peace (2006), compiled from the work of participants in the therapeutic poetry workshops she has led for more than 500 veterans of war. Her honors include the National Endowment for the Humanities’ National Humanities Medal (presented by former President Bill Clinton), the American Academy of Arts and Letters’ Award in Literature, the National Book Foundation’s Lifetime Achievement Award, and the title Living Treasure of Hawaii. She is a professor emeritus at the University of California–Berkeley and lives in Oakland, California. Kris Welch is a veteran, very popular KPFA on-air host, a mother, and a devoted grandmother.